It will go on sale beginning at Noon (Eastern) and be offered for $57.95. No mintage limit is in place on the release. 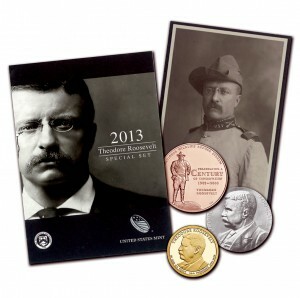 Also included in the Coin and Chronicles Set is a print and booklet offering educational information on the 26th US President, Theodore Roosevelt. This release is a first for the United States Mint. Never before has a Presidential medal been struck from one ounce of .999 silver. It also marks the first time a Coin and Chronicles Set has been issued as part of the Presidential $1 Coin Program. Of note, in 2009, the Lincoln Coin and Chronicles Set was issued. That release, however, was issued as part of the bicentennial celebrations of the birth of Abraham Lincoln, the 16th US President. Instead of any associated Presidential $1 Coin, the Lincoln Coin and Chronicles Set included one 2009 Lincoln Commemorative Silver Dollar and the four different Lincoln Cents issued that year. Purchases of the soon to be available Roosevelt Coin and Chronicles Set may be made directly with the United States Mint, once released. Orders are accepted on the Mint's website located at www.usmint.gov or by calling 1-800-USA-MINT (872-6468). Hearing- and speech-impaired customers with TTY equipment may order by calling 1-888-321-MINT (6468). A shipping and handling fee of $4.95 will be added to all domestic orders.